A coarse, hairy perennial Virginia fen-rose or seashore mallow is much-branched and angular in habit. A large plant with pink, terminal or stalked flowers with yellow stamens. It grows 3-5 ft. tall and spreads to 4 ft. in width. Its leaves are triangular-ovate with triangular lobes at the base. The hibiscus-like flowers are light pink and 3 in. across with a central column of yellow stamens. This Mallow is especially abundant in southern Louisiana. It is distinguished from Hibiscus by the flat ring of fruit segments. K. altheaeifolia, found on east coast of Texas, is recognized by some botanists as separate species; others regard it as a variety of K. virginica. 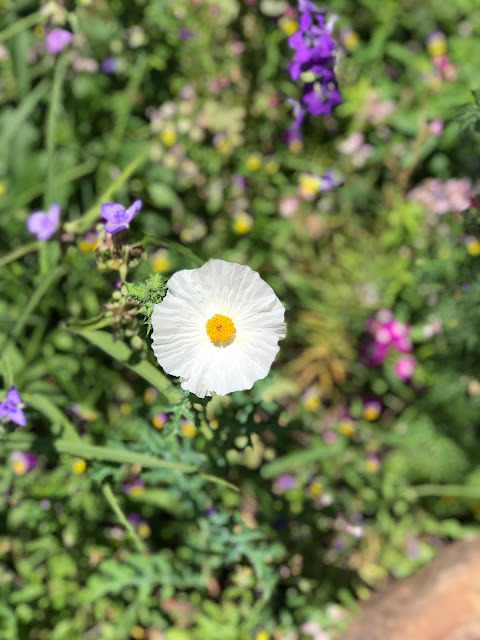 Salt Marsh Mallow prefers full sun, but in my garden I've found that it still blooms well in partial shade. It's a reseeding perennial but not aggressively so, and unwanted seedlings have been easy to pull. If the plants get too tall in a particular spot, cutting them back a few inches doesn't seem to harm them: they may sulk for a day or two, but they get it over it. Since they do self-sow, I also have no compunctions about pulling them up: they do seem to reach a point where they have far more seedpods than blooms. They grow quickly enough that it's not long before the younger plants are flowering plentifully. I see that the LBJWC claims the plants reach their mature height of 4-6 feet in about 5 years: my experience has been that they reach 4 feet in ONE year. While I haven't seen it in Houston area nurseries, it may be available through Mercer Arboretum's March Mart. Or you can send me your snail mail address and I'll be happy to send you some seeds in return. Since they say the seeds germinate when the soil temperature is over 70, I imagine we have plenty of time for you to get plants started! That's pretty... it sorta looks like a big radar dish. I wonder if aliens use it to channel back messages to their planets? I'll bet they do! Signed "Not Carol, but one of the garden fairies who took over her laptop this morning"
Thorn Goblinfly, is that you? Or is it that dashing but mischievous Barley Mahoenee? Carol really should keep a closer eye on her laptop!